Digital Loan against Mutual Funds (LAMF) - Should you opt? Home » Mutual Funds » Digital Loan against Mutual Funds (LAMF) – Should you opt? 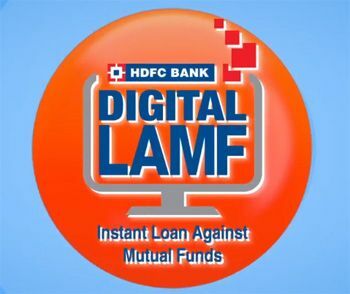 Digital Loan against Mutual Funds (LAMF) is new facility by HDFC. This facility allows you to get a loan against mutual funds instantly. So, if you are mutual fund holder and looking for an urgent cash in an emergency situation, you can leverage your mutual fund portfolio to avail money without liquidating your investment or stopping regular investment plans or SIPs. What is Digital Loan against Mutual Funds? Digital Loan against Mutual Funds, as the name suggests it is paperless, instant overdraft loan facility against a mutual fund. The main rationale behind the launch of this facility is to reduce the time required for approval of the loan and address instant cash requirement of the customer. As of now redemption of mutual funds take minimum 3 days. Even any loan approval takes minimum 2-3 days’ time. Even it requires a lot of documentation. Digital LAMF, helps you to get an instant loan in 3 minutes. You just need to select mutual fund which you would like to pledge, calculate overdraft limit and open a current account online and get the money into account instantly. This product is available for resident Indians and for portfolios which are individual holdings. The facility of Digital Loan against Mutual Funds is given to HDFC customers only. The first-time borrower with no credit history can also avail the facility of Digital LAMF. Also Read – Loan Against Property – Should you opt? How much you can borrow under this scheme? If you are taking a loan against equity-oriented mutual funds, you can select any amount between 1 Lakh to 10 Lakh in permissible multiple based on your mutual fund holdings. In case you are planning to take a loan against debt fund, you can get loan up to 1 Cr based on the valuation of your mutual fund. Based on nature of mutual fund schemes loan percentage is decided. If it is equity mutual fund you can get 50% overdraft facility. If it is debt fund you can avail 80% overdraft facility. What is interest rate applicable for Digital Loan against Mutual Funds? The interest rate applicable to Digital Loan against Mutual funds is floating. It is linked to Reference Rate (HDFC Bank’s Marginal Cost of Funds based Lending Rate (MCLR) for the time being). As it is a loan against security, the interest rate charge is lower compared to personal loan. Annual Percentage rate applicable on Digital Loan is given below. The interest rate is applicable only on the amount you actually utilized, and not on amount opted by you. In addition to interest rate following other charges are applicable to this loan. Annual Maintenance Charges – 0.50% of the sanctioned credit limit. Minimum Rs.1000 and maximum up to Rs.5000. HDFC Digital LAMF is offered against any equity and debt fund offered by following mutual fund companies. You can avoid selling your best performing mutual fund and use LAMF in case of money requirement. Instant loan approval and availability of money in few minutes. Entire process is digital and does not require physical visit to bank branch. Loan is offered against both debt and equity based mutual funds. Overdraft account and interest applicable only on the utilized amount. Loan amount can be enhanced any time. 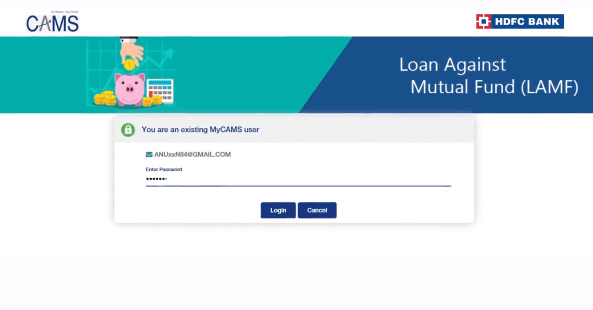 How to apply for Digital Loan against Mutual Funds? The process of applying for a digital loan against mutual funds is very easy. You can apply for a loan in three easy steps. Log into to your CAMS via HDFC NetBanking facility. You need to use your HDFC bank account ID, password. After entering your KYC detail and selecting relevant options you will be taken to mycams website. Input One Time Password (OTP) and enter branch detail where overdraft account is required. Should you opt for Digital Loan against Mutual Funds? A most important question that must be popping up in your mind is should I opt for this facility? Well, it depends on the purpose of loan and urgency. If you want to avail this facility for buying a bike, expensive wristwatch, cloths, foreign vacation or entertainment. It is BIG No for LAMF. You should use loan against the mutual fund in case of extreme emergency situations such as medical need or dreadful need of fund, where you don’t have any other option and you want to liquidate your investment made for a specific financial goal. Ideally, you should make an emergency fund. An emergency fund is planning for the unplanned event. The emergency fund will help you to fight with financial emergencies like job loss, unwanted medical expenses and you can avoid taking a loan for emergency. « Dividend Stocks in India – How to find highest dividend paying Stocks?